This photo may look wonderful but is a real one. 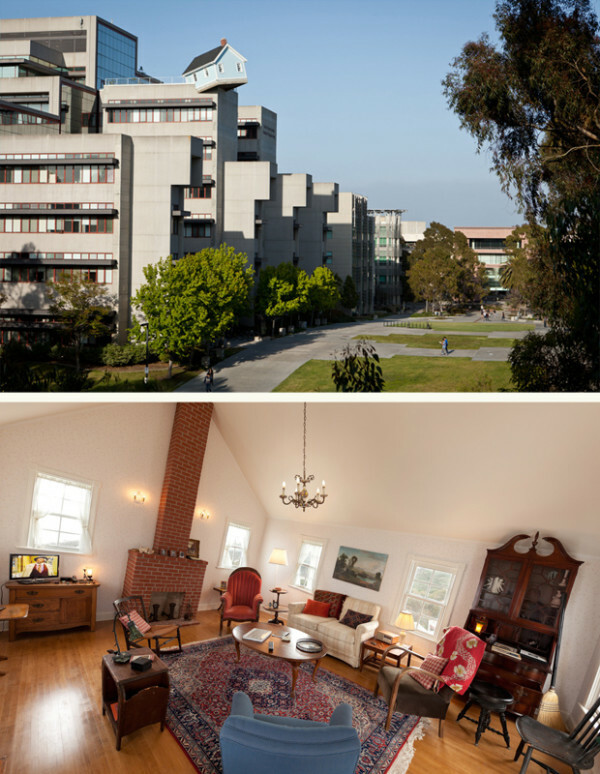 South Korean Do Ho Sue struggled for seven years to complete the sketch design of this cottage atop the Engineering Building 1. 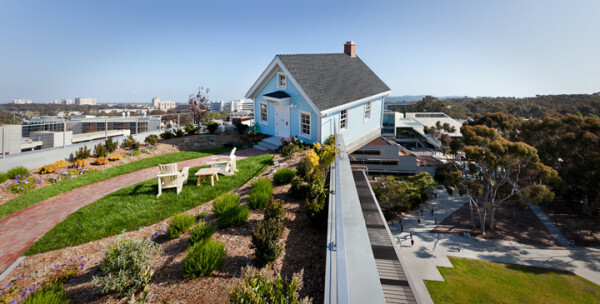 This cottage has been so made as if it was hanging on the edge of the seven floor building in University of California, San Diego. It is hard to miss looking at the cottage while visiting the campus.The cottage has been named ” Fallen Star” which matches its status of hanging. The university administration gave permission for making this hanging cottage to Artist Do Ho. Standing on the ground, no one can believe that the Fallen star has a beautiful garden and that it has 15 by 18 beautiful hall. The cottage is cantilevered at an angle of ten degrees slanting downwards from a corner of the seventh floor. This cottage can be viewed from afar and gives a feeling of elation. The cottage is five degree outside the floor of the building. Those entering the cottage feel as if they are falling. The cottage is so built to withstand winds up to 100 knots.The foundation is 18″ thickness instead four inches in customary practice. Do Ho Suh is of Korean origin but raised and educated in the US. He wants that Engineering students should come and study this outstanding contribution. The director of UC Mary Beebe, is particular to give a feeling of home to the students who may have left their homes for the first time. They should feel that we have a home and not barren class room with no relaxed atmosphere. The photographs and the furniture have been forwarded by the donor members. All in all the idea is to feel at home away from home. Even the birds and bees are a pleasure to watch and ponder.